WASHINGTON — Abuses appear "normal and allowed" in Myanmar's response to an armed uprising by Rohingya Muslims, a senior U.S. official said in an interview, casting a pall over one of President Barack Obama's legacy foreign policy achievements. Obama and his advisers have long held up the former pariah nation's U.S.-backed shift from military rule as a breakthrough for American interests and democratic values in Southeast Asia. But the situation in strife-hit Rakhine State makes the transition no straightforward success story. Rakhine has been largely closed off to foreigners, including aid workers, since a deadly insurgent attack against police in October. Subsequent "clearance operations," led by the military and reminiscent of its decades of junta rule, have left at least dozens dead. Tens of thousands of Rohingya have escaped to neighboring Bangladesh. Tom Malinowski, the State Department's human rights chief, questioned the credibility of that investigation. He said a video of Myanmar police kicking and beating Rohingya — filmed by the police and recently surfaced on social media — suggests a disturbing pattern. "People don't film themselves committing a human rights abuse unless they think that doing so is normal and allowed," Malinowski told The Associated Press. "What that video suggests to me is that this kind of behavior, at least with respect to whatever unit or elements of the security forces was involved, has become normalized, much as the photographs at Abu Ghraib taught us the same lesson about things that were going on in our military in Iraq at the time," he said. 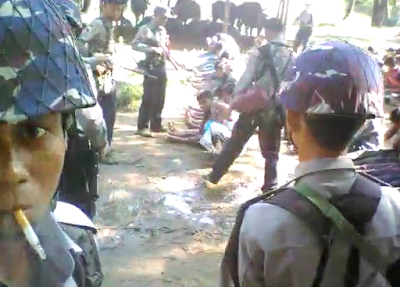 The government of Myanmar, also known as Burma, has verified the video and detained the police officers involved. But it insists the incident is an "isolated case." Human rights groups and neighboring, Muslim-majority Malaysia accuse Myanmar's civilian leader, Aung San Suu Kyi, of failing to protect the Rohingya. The Nobel peace laureate is hobbled by her lack of control over the powerful military but harsh national politics also play a role. Myanmar's majority Buddhists loathe the Rohingya. Many of the more than 1 million-strong community have lived there for generations, but they lack citizenship. The Rohingya bore the brunt of intercommunal violence with Buddhists in Rakhine in 2012 that left hundreds dead and forced more than 100,000 into squalid camps. As early as two years ago, Malinowski said, the U.S. expressed fears to Myanmar's government that the grievances of Muslims needed to be addressed. Otherwise, he said, "outside forces would eventually exploit those grievances to promote a violent reaction." "It does seem that something like that, at least on a small scale, has happened," Malinowski said. "We do want to support the government of Burma in protecting its people and its borders. We want to help them do it the right way. That means not falling into the trap of an indiscriminate response that fuels recruitment for groups that may be using violence," Malinowski said.